The US and Israel have both been vocal about Iran meddling in other nations’ affairs. 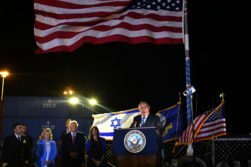 The Israelis have taken action to prevent Iran from establishing a militaristic foothold in Syria, where the Iranians have backed the regime for years. As for Yemen, the US has highlighted the Iranian weapons that have been delivered to the Houthi rebels battling the Saudi-backed Yemeni regime and have even been turned on Saudi targets. In Iraq, the US is wary of Iranian influence and sponsorship of terror. Just last week, US Secretary of State Mike Pompeo called Iran “the origin of the current threat to Americans in Iraq,” according to comments published by the State Department. The docking of the American Destroyer class USS Ross also honored 243 years of the US Navy. US Ambassador to Israel David Friedman was quoted in the Israeli press release as highlighting the appropriateness of having the Ross dock in Israel. “I hope the symbolism of this moment is not lost upon anyone. Israel and the United States have enjoyed a close and mutually beneficial relationship for decades,” Friedman was quoted as saying. Netanyahu certainly got that message, and shared it himself. “It is American power that protects American values that are universal values that we in Israel share. And the preeminent value is that of liberty. The US navy’s role in this is enormous,” said the Israeli leader.